Pluit is a Jakarta area located on the edge of Jakarta Bay. The combination between the grandeur of the metropolitan city and the beauty of the sea produces breathtaking scenery. There are various things to do in Pluit Jakarta. Let’s find out ..! Waduk Pluit Park is a favorite spot for picnics in Pluit. A shady atmosphere and wind breeze from the reservoir make visitors happy to linger here. In addition to picnics, Waduk Pluit Park also serves as a place to exercise. The park features a jogging track, outdoor gym, basketball court and a children’s playground. 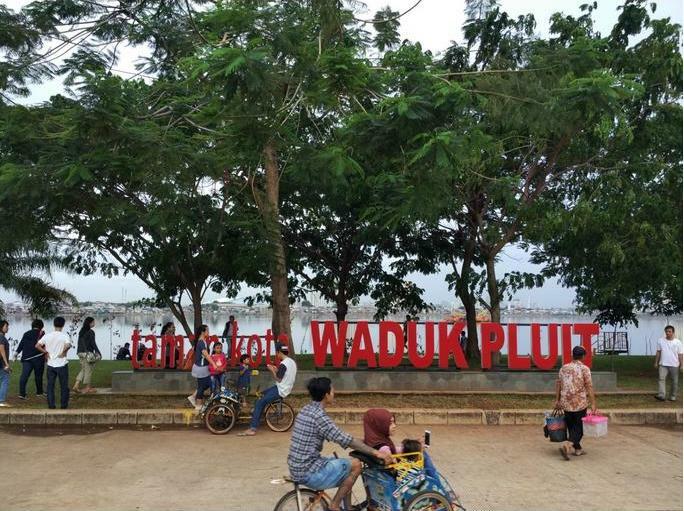 Waduk Pluit Park is located at Pluit Timur Raya Street, Pluit, Penjaringan, North Jakarta. It’s free entry. 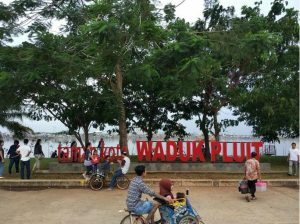 Picnic at Waduk Pluit Park is just one of things to do in North Jakarta. Muara Angke Mangrove Forest and Wildlife Sanctuary is the only natural area left in Jakarta. This area is the habitat of long-tailed monkeys and some typical Javanese birds. 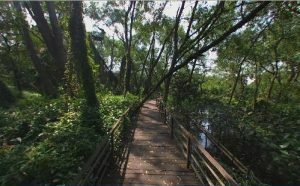 To get around Muara Angke Mangrove Forest and Wildlife Sanctuary, visitors simply walk on a wooden bridge. But visitors can also get around by boat with the help of the officers. Muara Angke Mangrove Forest and Wildlife Sanctuary is located in Muara Angke, Penjaringan, North Jakarta. To enter here visitors must ask permission to Balai Konservasi Sumber Daya Alam DKI Jakarta, Salemba Raya Street, Central Jakarta. Phone: 021-3908771 / 3158142. Baywalk Mall is located on the edge of Jakarta Bay. Some might say that its strategic location is the reason why lots of people come here. The favorite spot at Baywalk Mall are the Baywalk Promenade where visitors can sit back while looking at the sunset. 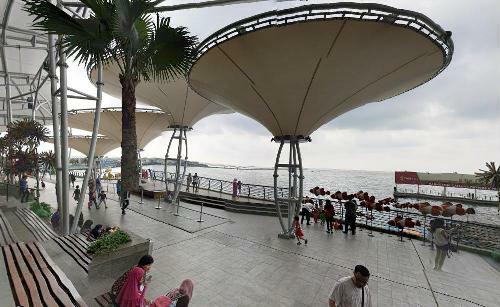 If you want a more privacy atmosphere, some restaurants at Baywalk Mall also have tables overlooking the sea. 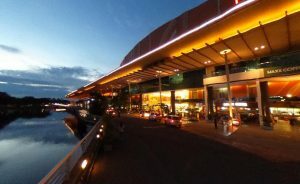 Baywalk Mall is located at Pluit Karang Ayu Street, Pluit, Penjaringan, North Jakarta. Opening hours is 10 am – 10 pm. Pluit Village Mall is one of the most popular and complete malls in North Jakarta. Here visitors can buy a various items ranging from foodstuffs, clothes, furniture, gadgets to electronics. 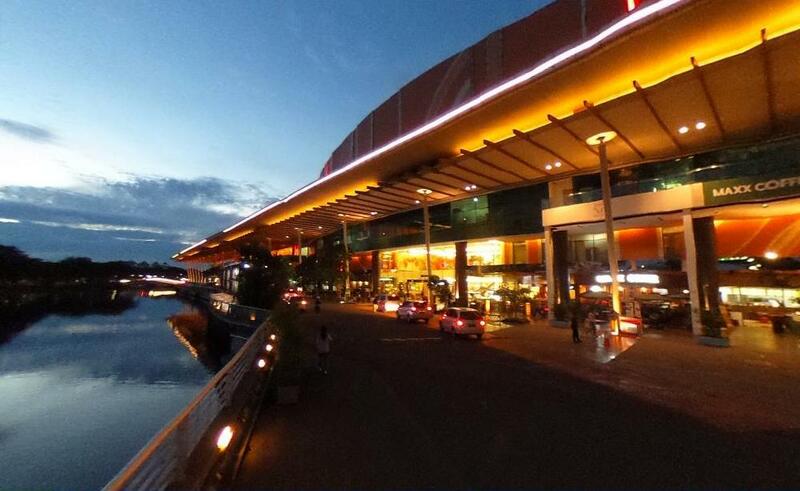 Pluit Village Mall can also be a place to meet with friends or hang out. There are a variety of cafes, restaurants and food courts. Pluit Village Mall is located at Pluit Indah Raya Street, Pluit, Penjaringan, North Jakarta. Opening hours is 10 am – 10 pm. Mall hopping is definitely one of things to do in Jakarta on the weekend. The Maritime Museum keeps the history of Jakarta as a port city. The museum occupies the Dutch heritage building built in 1652. 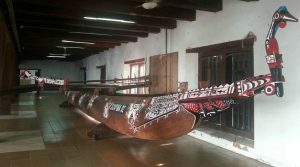 Miniature of boats from various tribes in Indonesia can be found here. At this moment the maritime museum is being renovated after a fire in January 2017. Maritime Museum is located at Pasar Ikan Street, Sunda Kelapa, Penjaringan, North Jakarta. The port of Sunda Kelapa becomes the place where traditional ships are docked. Here you can see the legendary Phinisi ships used by Indonesian seafarers to sail the oceans. The Port of Sunda Kelapa is one of the most instagramable spots in Pluit. Traditional ships and old buildings from the Dutch era will certainly be a beautiful photo background. 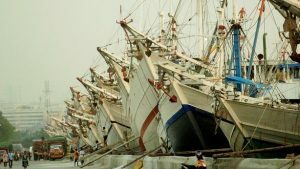 Port of Sunda Kelapa is located in Penjaringan, North Jakarta. The admission is Rp 2,500. It opens 24 hours. Jetski Café is located on the pier that makes visitors have a great view. Here you can see the beauty of the sunset at Jakarta Bay and the flickering lights that decorate Jakarta at night. The cool sea breeze will make you feel at home to linger here. Jetski Café serves Indonesian food menu, Western food and seafood. Jetski Café is located in Mutiara Beach, Pluit, North Jakarta. Opening hours for weekdays is 4 pm – 10 pm, weekends is 8 am – 1 am. 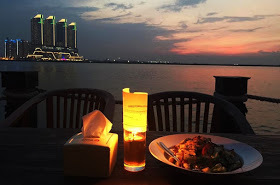 Dinner at Jetski Cafe can be one of romantic things to do in Jakarta. 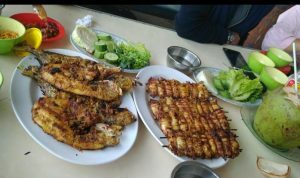 It is not complete to visit Pluit if you have not tasted grilled fish. Ikan Bakar Sinar Muara Angke serves grilled fish whose delicacy has been famous for a long time. The fish menu is varied, you can choose which fish to eat. In addition to fish, the place also serves crab, shrimp, squid and shellfish. Ikan Bakar Sinar Muara Angke is located at Dermaga Street, Muara Angke, Penjaringan, North Jakarta. Opening hours is 10 am – 10 pm. Many culinary lovers say that Sushi Masa is the best sushi restaurant in Jakarta. 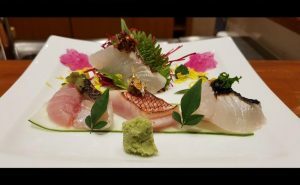 They have chefs imported directly from Japan to ensure the quality of the dish at the best level. Located in the harbor area, Sushi Masa has beautiful views of Jakarta Bay. It’s good for you to call first for reservations because this restaurant is very popular. Sushi Masa is located at Tuna Raya Street, Penjaringan, North Jakarta. Opening hours is 11 am – 2 pm; 6 pm – 10 pm. It’s closed on Monday. If you want to experience the sensation of staying by the sea, try to stay at Regatta Condominium. You can wake up in the morning accompanied by the beautiful sunrise or relax in the afternoon looking at the sunset. Regatta Condominium has complete facilities such as gym, café and convenience store. Some might say the building looks like the famous Burj Al Arab in Dubai. 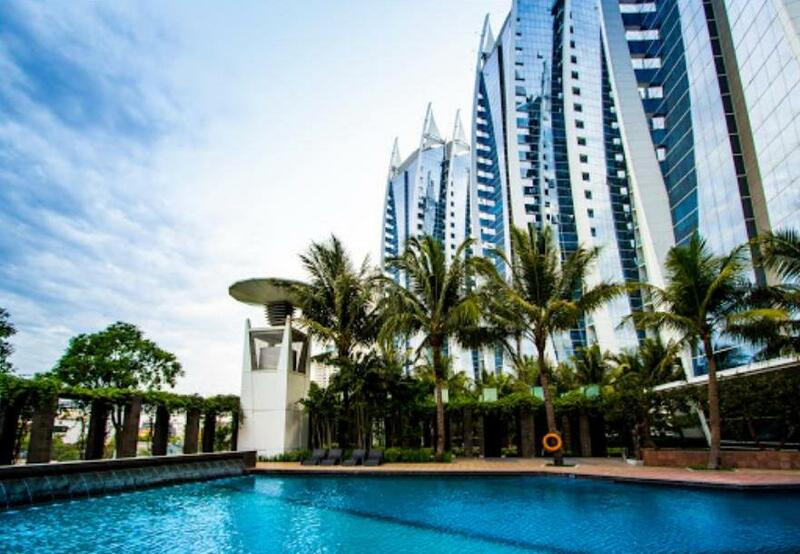 Regatta Condominium is located at Pantai Mutiara Street, Pluit, Penjaringan, North Jakarta. 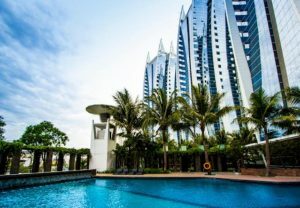 Toward the end of the year, many hotels in Jakarta will provide a promo price to welcome the New Year. Surely you can’t miss staycation as one of things to do in Jakarta in December. All right guys, now you have a lot of ideas on things to do in Pluit Jakarta. Take time to explore the seaside area of Jakarta. Let’s visit Pluit Jakarta..!